Meet Brenda Katwesigye: A telecom engineering graduate manufacturing high quality, affordable eyewear in Uganda. When Ugandan born Brenda Katwesigye made the decision to start a company that manufactures prescription glasses, she didn’t know where to start! She didn’t know the materials she would need to buy to make the first pair, or who she would sell the first pair to. Her background in financial auditing wasn’t much help either. Today, Brenda’s company - Wazi Vision Limited is a growing company that provides affordable and accessible eye care to school going children, and youth aged 17-30 years in Africa. Brenda studied telecom engineering in university. When she graduated, she worked at an audit, consulting and financial advisory firm where she worked in risk management and IT auditing. She loved her job, but felt compelled to become an entrepreneur when she began to notice business opportunities that resulted from a lack of products and services in Kampala where she grew up. At work, Brenda would spend countless hours analyzing IT infrastructure policies and operations, and also developing risk management plans. Over time, her eyes began to hurt frequently so she decided to visit an optician for an eye test. Not only was the eye test expensive, but the optician also recommended an expensive pair of glasses that cost Ugandan shillings 600,000 (approx. $160). Brenda wondered how many people in Uganda could afford a pair of glasses at that price. The design on the glasses was also plain – another factor that would dissuade any buyer who may be looking for something attractive. So she bought the pair that was recommended to her and began thinking about how she could provide a more cost effective eye care solution to a majority of Ugandans. In 2016, Brenda started her journey to making Wazi Vision Limited a reality. “The transition to self-employment, and the eye care business was tough, she says. First, she lacked expertise and a network. Secondly, because this was a new business line and she did not know where to source raw materials from, she was unable to secure funding for product development. Brenda had completed her market research and knew there was a demand for quality yet affordable eye care. She just didn’t know how to implement her idea. In February 2017, Wazi Vision was incorporated as a limited company and sold its first pair of glasses that same month. 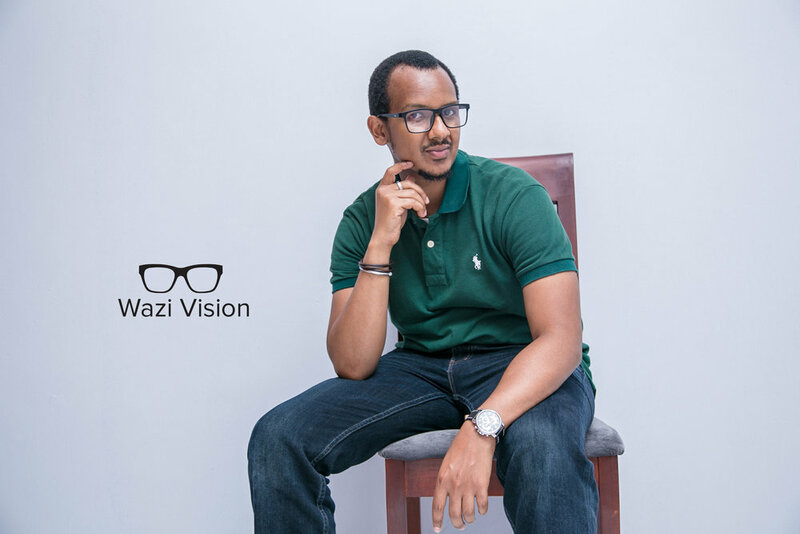 Today, Wazi Vision Limited is a proudly owned Ugandan company that manufactures high quality glasses at affordable prices. The company offers door to door delivery for its customers, and all its products are made from recycled plastics – what a way to clean up our environment!! 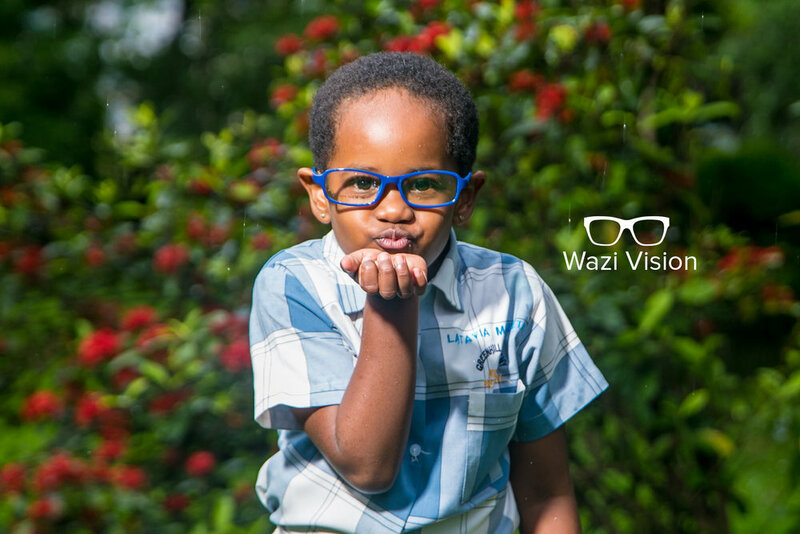 Initially, Wazi Vision primarily targeted school children but because it is an innovative company that is driven by customer demand, they re-strategized to meet the growing demand for quality and fashionable eye wear for youth aged 17-30 years. Wazi Vision’s team consists of professional creative artists who draw designs after engaging with youth and understanding what they want. To get this information, the company leverages social media which young people use all the time. They ask questions online using their Twitter, Facebook and LinkedIn accounts, and receive feedback and comments from the youth. The team develops new designs frequently, and revises them to meet customers’ needs. Like any business, Brenda’s business challenges change all the time. When she first set up shop, building a business team was difficult! It was hard identifying candidates who met specific qualifications. On-boarding was always an issue, and maintaining good employees was a constant battle. Nowadays, she hires based on recommendations. Brenda focuses more on a potential employee’s attitude than their skills. This, she says, is a sure way of hiring a team member who is willing to take direction and learn new things. Manufacturing in Uganda is very expensive. Most times, it is hard to procure quality raw materials. The high cost of power is also an on-going challenge. But still, for Brenda, the joy she sees in a young person once they buy a new pair of Wazi Vision glasses and are able to see better far outweighs the business challenges. Let your business speak for itself before you brand yourself around it: If you’re making jewelry and there’s a story behind the jewelry, let that speak for itself even before you speak. People should want to buy your product or service because they need it, not because of you. Grow your networks strategically: Growing your network isn’t just about meeting a lot of people. It’s also not about exchanging business cards. It is more about building relationships. Most of the connections I’ve received have been from people I have built relationships with. I maintain relationships by going out of my way to treat my networks with respect, and making time to get in touch with them to figure out how I can be of value to them, not only how they can be valuable to me. Over time, without even trying, people have started finding out about my business. I also like connecting people. Attend conferences that are of significance to your business and personal growth: Do your homework and find your spotlight – find out who is attending the conference and figure out how you can get their attention. It’s normally easy to get lost in conferences so take time to determine how best you can get the word out about your business and what it does. Team Thelela is so excited to see Wazi Vision Limited grow from ideation phase to full implementation. Way to go Brenda!